In Nepal the cult of the man-bird Garuda has great importance, as he is the vahana or mount of Vishnu, of whom the king of Nepal is regarded as an incarnation. Thus in some later royal portraits the king is assimilated to the image of Vishnu riding Garuda. 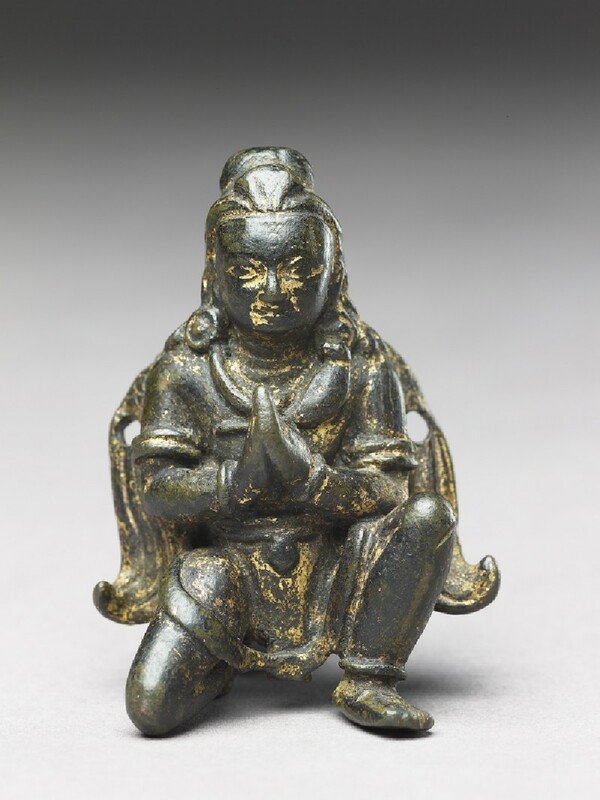 Sculptures such as this kneeling Garuda are also commonly found, in this case probably positioned beside an image of Vishnu as an attendant, for he raises his hands in the anjali mudra of greeting or adoration. Except for his wings and the lightly incised third eye in the middle of his forehead, Garuda here appears in anthropomorphic form: without claws or beak and with a human face and body. He wears a tiara with three triangular panels tilted towards the chignon piled in a high dome at the back of the head. The hair drawn up to the chignon is combed in vertical striations; beneath the chignon, there are six thick coiled locks of hair hanging to shoulder length. He wears small cylindrical disc earrings, with a round element at the centre of the left earring; the right earring is flat. His wide wing-appendages have two small drilled holes, to allow the image either to be worn as an amulet or to be fixed to a support. The image is quite flat at the back, with almost no projecting volumes, save for the head. Thus it could have been worn as a necklace pendant. Garuda here is adorned with double arm-bands which recall the snake armlets of Padmapani (cat. 2). He also has ankle bracelets, and as a necklace the body of a cobra whose head is visible over his heart; the cobra’s tail is knotted to protrude over the opposite side of the chest. His dhoti is very short, with no visible fabric pattern: there is a central panel of fabric with a stylized round jewel at the level of the navel. The hem of the dhoti is in relief. His limbs are slender and lithe. The iconography for this aspect of Garuda has been popular in the Kathmandu valley since the fifth century, and became particularly evident in royal portraits of the seventeenth century. However, a much earlier date is suggested here, due to the frontal angle of the head and the body. The facial shape, features, and frontal alignment show a strong affinity with a stone Garuda attributed to the eighth century, in Kathmandu . Garuda’s head in our image is facing forward and gazing straight ahead with wide almond-shaped eyes, rather than showing the jaunty angle of the face aligned with the left leg, bent far to the left, which was later popular . He is here genuinely kneeling as if ready to rise to attention; the posture is not a stylized genuflection. The planes of his face are very broad, not overly fleshy, and modelled to form a squarish jaw. His nose is aquiline and the lips are thin, forming a slight smile. Although the eyebrows are not widely arched above the eyes, the facial features, shape of head, the hairline raised in relief, and the overall frontality also recall the gilt copper repoussé sculpture of Vishnu riding on Garuda dated 1004 in the Zimmerman collection . Thus a date around the tenth century is proposed for this small yet strong image of the young bird-man, both dynamic and devout in his service to Vishnu. 1 See Pal, The Arts of Nepal, vol. 1, pl. 102: stone Garuda (H. c. 1 metre) at Narayanhiti, Kathmandu. Note that the shape of the wings, very close to Garuda’s body, and the elegantly restrained curl of the feather tips are virtually identical with those of the Ashmolean Garuda. 2 See e.g. Pal, The Arts of Nepal, pl. S40, dated to 1500 or earlier. 3 Pal, Art of the Himalayas, pl. 10.